A twenty-five year birthday sets many folks to thinking, that's a quarter of a century! 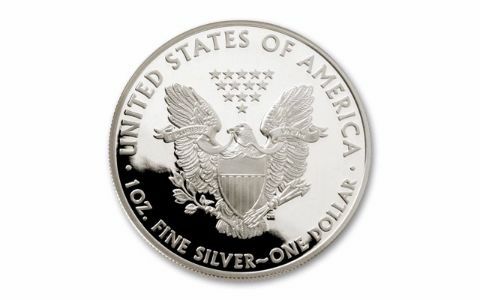 Well, the American Eagle Silver Dollars reached that milestone in 2011, celebrating the widely popular coin program established by Congress and President Reagan in 1986. In the intervening two and half decades, the Silver Eagle became the most collected coin, not only in America, but also around the world. 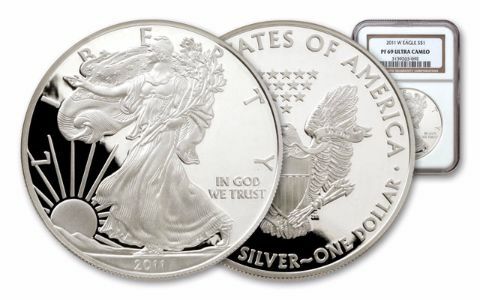 As a result, these big one-ounce of 99.9% silver beauties are snapped up whenever they're available. This can make previous years' Silver Eagles hard to find. So, we're pleased to make the 2011 coins available for you to add to your collection today. Even better, you can secure yours as deeply mirrored and frosted Proofs, the pinnacle of coin collecting. The 2011 Proof is even harder to find than many other years. 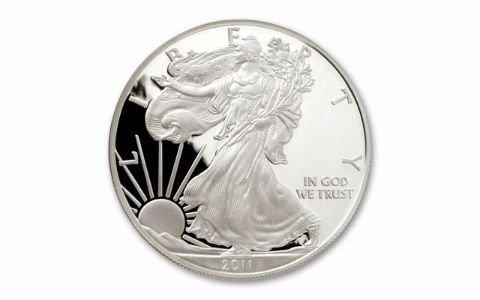 Because silver prices were rapidly fluctuating, the mint didn't release the proofs until mid-July. Consequently fewer than 100,000 2011 proofs were minted, barely a quarter of previous years' mintages. 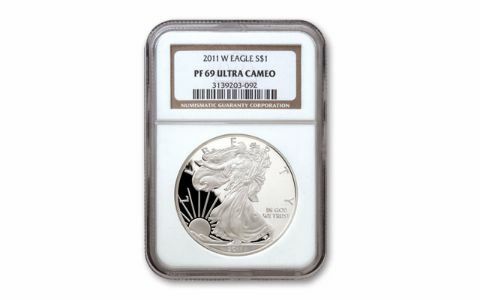 The 2011 Proof Silver Eagle is even more coveted graded by Professional Coin Grading Service (PCGS) and Numismatic Guaranty Corporation (NGC) in Proof-69 (PR69, PF69) condition. Grading service varies. Claim your prize now!